When we first moved to Costa Rica we brought as much with us as we possibly could, and rented a “furnished” home, but we are still shopping for all those little extras that make a house a home. 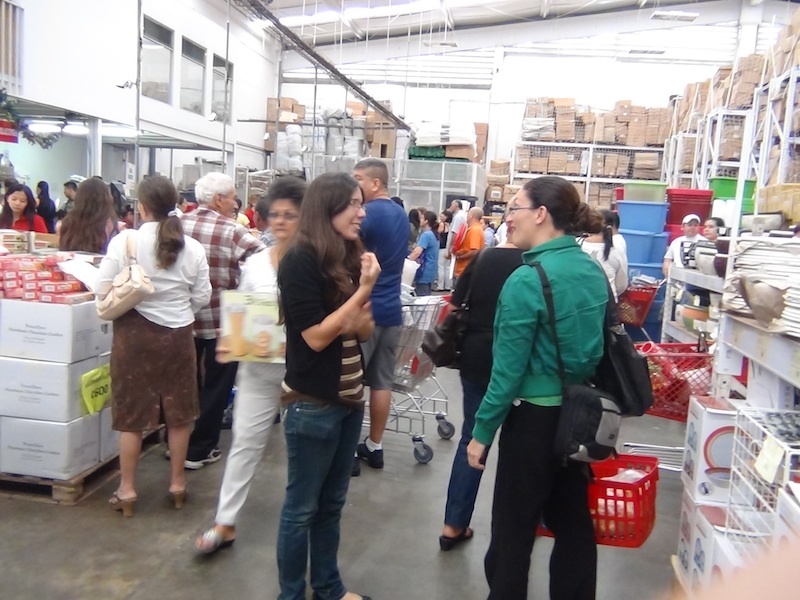 We first made a trip with some friends to Price Smart, a Costa Rican version of a Costco or Sams Club. You need a membership to shop there but from what i’ve heard it’s only $30 a year for a family membership which includes two cards. We stocked up on groceries like goldfish, craisens, peanut butter, string cheese etc. that are hard to find at the local grocery stores. We also were able to get big boxes of diapers for cheap, “higher” thread count sheets, and cheap beer! Unfortunately there weren’t any 6ft tall boxes of fireworks like in Puerto Rico, but maybe closer to the holidays. Once we got a car we ventured over to Escazu via the new highway, a BLESSING for those of us who get carsick, and hit up the Multiplaza which houses the Auto Mercado, the most “American” way to do your grocery shopping. The Multiplaza is the local mall and from what I’ve heard the most upscale in all of Costa Rica. I haven’t had a chance to walk around and check it all out yet, but I’ll give an update when I do. The Auto Mercado is a clean, well-kept and nicely laid out with big isles. You can find lots of randoms here that you might not be able to find elsewear such as Tahini for hummus. They also have a great selection of produce, although I prefer to do our produce shopping at the central markets for the best deals and strait from the growers. Yesterday we visited the Wall-Mart in Alajuela. Now don’t going throwing shade my way, we hardly ever stepped foot in Wall-Mart in the States, but here in Costa Rica where it’s hard enough locating simple everyday items, we are making an exception- on occasion. The Wall-Mart was very large, clean, and well-kept, actually alot nicer than ones I’ve seen in the States. It did have great prices and large selections on alot of items, but we did find some things were cheaper at the Price Smart. For example we picked up a fan and a blender at Wall-Mart then headed across town to the Price Smart and found the items there to be better quaility for cheaper, although there was only one style to choose from. But out of all these shopping options we have found one of our favorite stores to be Pequeno Mundo. It is a close out store you would shop at in the States comparable to Big Lots but larger and more warehouse style. It is perfect for all those household items you’d rather not pay alot for. We’ve purchased lots of great stuff there including: cleaning supplies, office supplies, home decor, a pack and play, groceries, and even clothes. Our friend who has been shopping there for years said they usually have a “core” stock of merchandise that you can rely on being there and then some extras that are only there only until they sell out, maybe a 80/20 percent ratio. I highly recommend hitting up the Pequeno Mundo if you are looking for great deals in the city!